Ole Miss women’s basketball started off its season in winning fashion Tuesday night, as Coach Yolett McPhee-McCuin led the Rebels to a 60-42 victory over the Norfolk State Spartans in her first game as head coach. Coming off an 18-11 record last season, their best in 16 years, Norfolk State got off to a hot start, taking an 11-2 lead right out of the gates while making their first four field goals. The Rebel defense started to take form, holding Norfolk State to just two points in the final seven minutes and 30 seconds of the first quarter. Ole Miss closed out the quarter with a 14-13 lead, and the Rebels never lost control. McPhee-McCuin stressed defense and toughness after the game and was proud of the way the team bounced back defensively. The Rebels seemed to find their stroke in the second quarter as they outscored the Spartans 21-11 during the period. Norfolk State’s offense cooled off after starting a perfect 4-4 from the field, shooting just 2-11 in the second quarter. They headed to the locker room facing a 35-24 deficit. 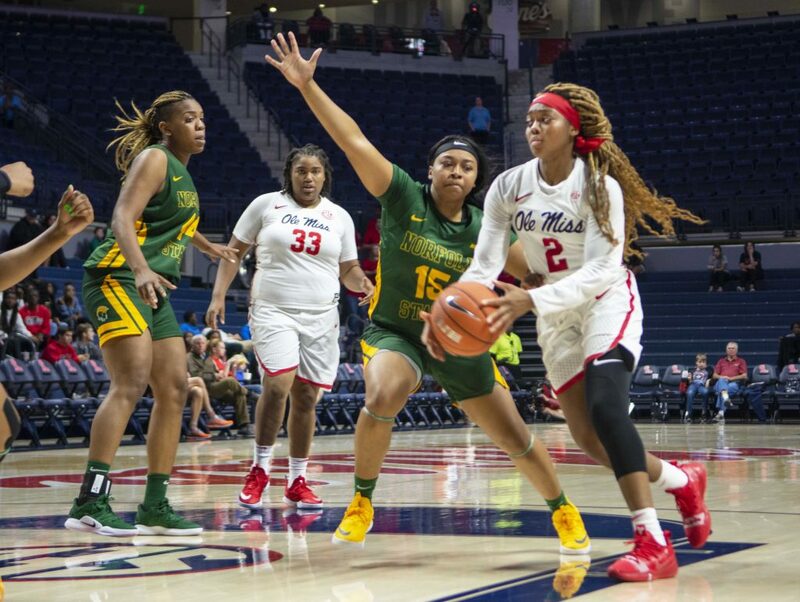 There were many positives for Ole Miss on the defensive end as they forced an experienced and talented Norfolk State team into 24 turnovers by being active defensively and diving after loose balls. Coach McPhee-McCuin has been preaching toughness on her roster, especially for her core of inexperienced players. “Defense is something that my teams have always been known for,” McPhee-McCuin said. Three Rebels finished the night in double digits. Crystal Allen led the Rebels in scoring with 16 points, while Jhileiya Dunlap finished with a double double, pouring in 12 points and coming up with 10 boards on the night. Shannon Dozier chipped in 11 point off of the bench. After transferring from the University of Texas at Arlington this summer, Allen was eager to get her start for the Rebels. She said it was relieving to make good on her first appearance at Ole Miss. “It felt like we were waiting forever for our first game to come,” McPhee-McCuin said. The result was not overwhelmingly positive coming against a far weaker opponent, but the bright spots and foundation were there for the Rebels to build on in the coming weeks before SEC play begins. The season will continue at 7 p.m. Friday at the Pavilion against Indiana University-Purdue University Indianapolis.